I decided to pull out my denim jacket after seeing Tasia rock hers - I guess I really should be wearing it year round. Love how just swapping out the accessories can transform the look! I've had my jean jacket forever...it goes with so many things! LOVING those black strappy shoes!! So pretty! I love how you took it from day to night perfectly. Your top is so gorgeous! It looks just as beautiful on its own as it does under a jacket! 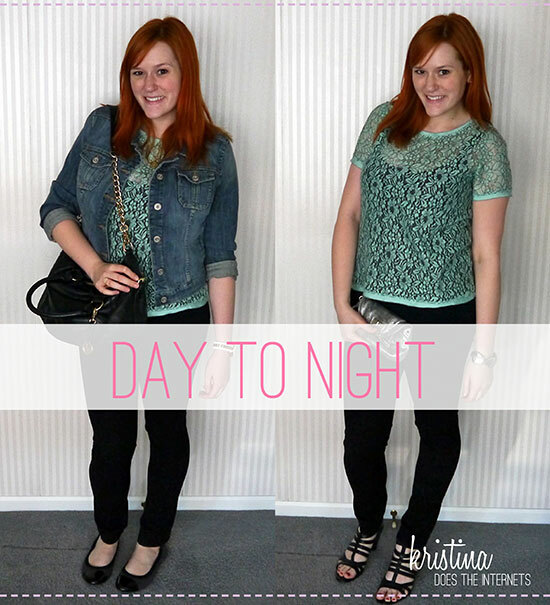 I love versatile outfits like this- being able to stretch a look from day to night is so efficient! this top is just perfect! This is such a great day to night transition. I love the top too! Love that top! This is a great day to night post. Thank you for linking up today. Love your outfit. I love when I can make it work! I love my jean jacket, I can't believe I hid it in my closet so long! That shirt is so pretty. The color looks great with your hair! Love the Night version! So pretty! This is so cute! 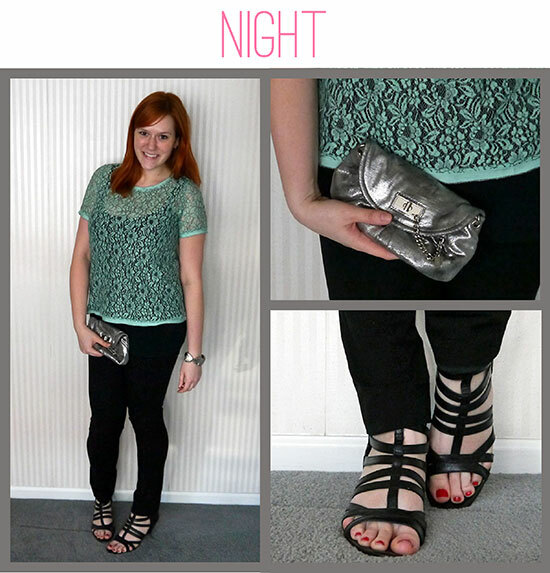 I love the clutch for your night look. I almost bought that top at Loft the other day! It is too cute. You look great! I wish I had better day-to-night looks, but it's kind of hard when you wear scrubs to work..... Haha love both looks! 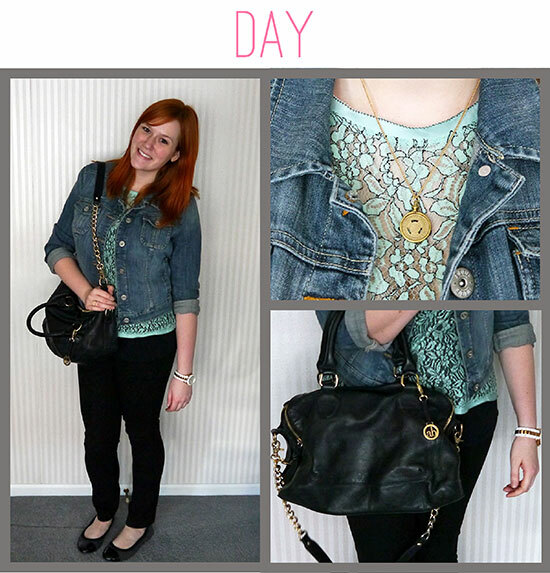 Such cute looks...LOVE love love that gorgeous lacy top! I love that you only made a couple simple swaps for a totally new look. I love seeing the day to night looks. I was just eyeing this top up at loft and now I wish I'd tried it on. You look great; I like both looks! Love that lace top!! So cute. I like both versions, but I think I like the day version best!